When I was a little girl, I used to write letters. While some of these went to family and friends who lived far away, many of them went to pen-pals that I found in a Pack-o-Fun magazine and, later, in Breyer magazines. I had pen-pals all over the states, in the UK, and even in Africa. Many of us wrote a lot about horses, and we even exchanged and traded booklets full of our information and notes and stickers so we got to know even more people that wanted to write letters too. Alas, as we all grew older, letters began to go unanswered. We grew up. Worse than growing up, we grew up into a new digital age, when you could meet and talk with people online – not just in letters. By the time ten years had passed, pen-palling had nearly gone the way of the dodo: if you wanted to meet someone new to talk to, just go find a forum or chatroom. E-mail them. It’s the same thing, right? In those younger years – how sad is it that I must pine for them when I’m not quite 30? – using a computer or typewriter for a letter was reserved for business. No, personal letters were painstakingly jotted by hand on paper, carefully folded and fussed into an envelope, decorated, perhaps scented, and then sent through the postal service. It is rare today that the handwritten letter passes through our mail system. Yet I’ve recently tasked myself with writing a purposefully handwritten letter to someone close to me, causing me to think back and remember the charm it requires. To write a handwritten letter, you first had to fuss over stationary. Should you simply grab the nearest notebook or legal pad and stuff it in a business envelope to save time? Or which set of stationary should you use – something feminine, flowery? Something fun, comical? Something restrained, calm? Did you have an envelope to match? What size paper would you use, did you have enough to write what you wanted to? Have you ever used this paper with your recipient before? Then there was the matter of the writing utensil, and the handwriting itself. The color of ink had to complement the stationary. Pencil was rarely used, as it easily smudged or ruined in the mail. The nature of the letter, and the intended recipient, often dictated whether we would use cursive or handwriting. Sometimes we mixed them together. If we wanted to get a quick note, or had a lot to say, sometimes we wrote too quickly and our words got a little jumbled, our cursive “bs” and “ls” indistinct. A new pal would often get a very slowly written letter, so our words were clear and precise as we both learned each other’s handwriting style. Of course, before the letter was sealed into an envelope, one must also had to determine if the letter itself would be decorated; if any little gifts like bookmarks or tea bags or stickers would be sent; and whether the envelope would also be decorated further, how it would carry a special seal, and if we should use a special stamp for stamp trading as well. Letter writing was an art form; not something to just be as quickly typed as fingers would let you and sent to some electronic box with no sense of permanence without the print button. Letter writing gave you something to look forward to when opening the mail box. Letter writing allowed you to be honest in a way no other medium truly could. Perhaps one day, we’ll care enough to return to the days of fancy stationary, writing pens, and thought out compositions to connect with each other. I’ll be waiting. This entry was posted in Personal Musings, writing and tagged letters, Mail, Pen pal, Penmanship, writing. Bookmark the permalink. Great post! To tickle your letter writing fancy, you might also check out this project: http://www.thingsunsaidproject.wordpress.com. Neat stuff. I must be very old fashioned; I have many pen pals around the world and I still hand write my letters to them. I love choosing the stationery (I have a lot of writing paper with matching envelopes) or if I’m using white lined paper, the stickers that I am going to decorate my letter with. I did have some e-mail pals but they were very lazy and would only send me bulk e-mail messages which weren’t fun to receive at all so eventually I gave up on them. Unfortunately some people prefer to type one letter and then send the same letter to all of their pen pals changing just the name of person that it is addressed to. I’ve become rather paranoid whenever I receive a typed letter now. I wonder why people choose to type their letters and then post them because they may as well use e-mail which is just as impersonal. 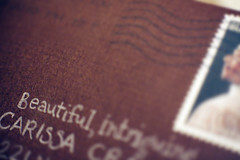 Handwritten, individual letters are the best letters to receive from friends.